Splunk was the winner of our annual survey in category "Data mining / Log Management"
Splunk indexes any kind of IT data from any source in real time. Point your serversâ€™ or network devicesâ€™ syslog at Splunk, set up WMI polling, monitor live logfiles, enable change monitoring on your filesystem or the Windows registry, or schedule a script to grab system metrics. 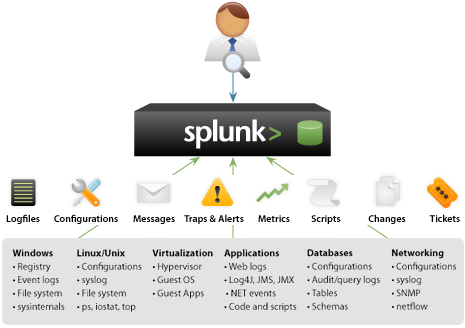 Splunk indexes all your IT data without the need for any specific parsers or adapters to purchase, write or maintain. Both the raw data and the rich index are stored in an efficient, compressed, filesystem-based datastore with optional data signing and auditing for data integrity. The more data you index, the more insight you’ll gain from your IT infrastructure. Drill down from charts to original events and determine root causes faster. Click on sections of charts to automatically refine searches without having to do so manually. Create workflows directly from data in search results and automate required next steps, such as opening a trouble ticket, blocking an IP address, or looking up a product ID in an external database. Create, schedule and deliver PDFs of any Splunk dashboard, view, search or report and share meaningful information with others in the organization, even non-Splunk users. Automatically identify new event types based on recurring patterns in the data. Integrates with enterprise single sign-on solutions for transparent authentication of third-party credentials and simplifies credential management.